Of course, we didn’t really know what freedom of speech meant at the time. Freedom of speech to us, at such a young age, was only an excuse to say anything we wanted without getting in trouble. Maybe this is more excusable when we are young, but even today, freedom of speech seems to be used by some people, no matter their age, as an excuse for poor behavior. That being said, I do not agree or support some of what Charlie Hebdo published. I respect their rights, but not their cartoons. Just because we have the right to do something does not mean we should. Satire is meant to expose and challenge opinions or events in a humorous or ironic way. Great satire is found in self-reflection. When we are able to see ourselves in our satire and chuckle, maybe even rethink our opinions – that is what makes satire effective. It shouldn’t be used to taunt a minority, which is what the people at Charlie Hebdo were doing. After all, Muslims only comprise between six to eight percent of the total population in France. In reference to the newest edition of the magazine, Bab, 31-year old L’Epeule resident told the Telegraph, “I feel betrayed. [The magazine is] simply putting more hatred into the hearts of extremists.” According to the British newspaper, this is a typical response from Islamic people in France. It is possible that some “Je Suis Charlie” advocates are simply trying to stand up against terrorism, but not agreeing with the content in the magazine. While I believe the authors of Charlie Hebdo crossed the line with their satire, their deaths are not justified. As Rafael Mantesso depicts in his cartoon, not agreeing with what someone has said under their right to freedom of speech does not excuse violence. 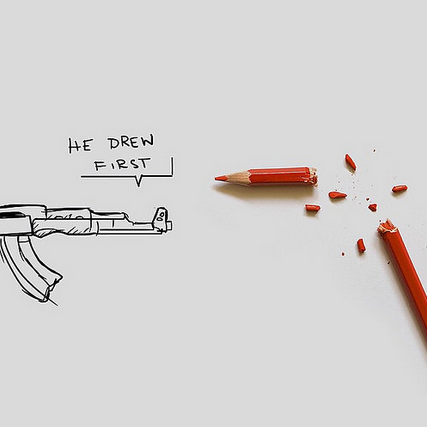 Rafael Mantesso’s cartoon reflects the violent consequences of the publications by Charlie Hebdo. Creative commons license. The authors at Charlie Hebdo knowingly offended others to sell magazines. They were mean for the purpose of being mean and attracting attention. And it worked. According to Brian Stelter at CNN, the magazine had a typical print of 60,000 copies per issue before the attack. The first issue since the attack, published Wednesday, Jan. 14, was originally set to print one million copies. However, that number was quickly increased to a distribution of five million copies. To be clear, I firmly believe in the legal right to express these ideas, and I think a lot of good comes from challenging ideas, norms and views. That being said, people should exercise judgment in regards to the expression those liberties allow. In the past few weeks, the world has raised questions about freedom of speech and where to draw the line. After all, how far is too far? It is very hard to draw a line, even one that is personal. As we grow and gain experiences, the line is constantly redrawn. If it’s so hard to set a personal limit to what we can and cannot express, how can we expect everyone to live within the same set boundary? How can we expect to draw a universal line? The fact is, we can’t. We can’t expect everyone to have the same breaking point. But as a society, we can encourage people to use freedom of speech as a tool of expression, not animosity. This is a mistake we made in kindergarten, when we didn’t know any better, and it is clearly a mistake some continue to make today. But we should know better. Freedom of speech is a privilege. It is a tool that we should use in our society as a way to express ourselves, but it should not be used as an excuse to be unkind or disrespectful, especially for commercial benefit. Wonderful perspective Jen. Where is the line? As always, you leave me wanting to read every article you write. Insightful commentary related to society’s inability to apply common sense to sensitive issues in a free world. Thank you for taking the risk to publish such a refreshing perspective on the elephant in the room. Applause, applause! I love the fact that you tackled this topic in your column.